In 1937 Pintacuda’s car was an Alfa 8C 35 with a blown 3800cc engine, as raced at Tripoli the year before. 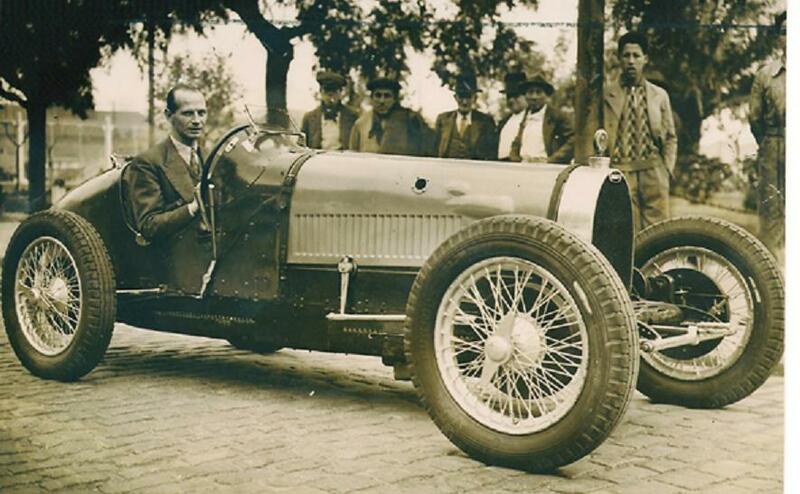 His rival was Hans von Stuck whose Auto Union was 100hp more powerful than the Alfa, and Pintacuda could only hope that the wet track would be to his advantage. The race started under heavy rain and von Stuck took the lead, but on the second lap, Pintacuda passed him and at half-way he was still leading by 18 seconds, and the rain had stopped. Pintacuda then lost the lead to the German but stuck to his tail, planning to pass him on the last lap on a stretch where the Italian car had better acceleration due its lower weight. However, four laps from the end, von Stuck had to go to the pits for refueling and Pintacuda was leading again by 20 seconds, having set a new lap record of 7 minutes 10 seconds. He couldn’t afford to make a pit-stop, and when he was 2km from the checkered flag, at 200 km/h, the Alfa ran out of petrol! Already over the top, Pintacuda managed to coast down the Marquês de São Vicente to finish in first place, with von Stuck four seconds behind. Driving along the Avenida Niemeyer today it is hard to imagine it as a race track, especially for Grand Prix racing. There were serious accidents in those early races, with cars crashing into the Av. Visconde de Albuquerque canal, but there is no record of anyone flying off the cliffs along the Niemeyer. One of the relics of those times is the Gruta da Imprensa, where the press would gather on race days. It is towards the Leblon end of the road, a platform built over the Viaduto Rei Alberto, named for the King of Belgium’s visit to Brazil in 1920. Avenida Niemeyer – named after Comendador Conrado Jacob de Niemeyer (not the Niemeyer you imagine), who donated land, and built by Eng Paulo de Frontin, was inaugurated in October 1916, with major improvements to the curves and surface for the royal visit in 1920. Interestingly enough, the original plan, dating from 1891, was to build a railway along this route, linking Botafogo to Angra dos Reis. 800 meters were built but the project was abandoned in 1913. Since then a series of crack Brazilian drivers has kept Brazil in the highlights of Formula One racing. The Interlagos track in São Paulo is named after one of them, José Carlos Pace, who won the Brazilian GP in 1975, but was sadly killed in a plane crash in 1977. The Rio track was named after Nelson Piquet, but this area is now being converted to an Olympic Park, and the race-track will be re-built in Deodoro. There are 30 names on the list of Brazilian drivers who have participated in Formula One or FIA World Championship races, including Chico Landi, Emerson Fittipaldi, Carlos Pace, Nelson Piquet, Ayrton Senna, Felipe Massa, Rubens Barrichello, just to mention the more famous of them. Younger members of the Fittipaldi, Piquet and Senna families are racing today. So don’t miss the Brazilian Grand Prix this November – the Interlagos circuit is claimed to be one of the most exciting in the world. I don´t know how old I was, but as a boy I actually saw one of these races. I was at my father´s partner´s house at the end of Leblon and I do remeber I was thrilled.